“The goal was to get audiences to lean forward in their seats to hear us”. 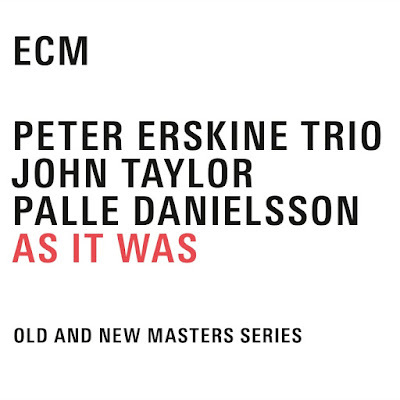 That was drummer Peter Erksine’s ambition for the trio under his own name on ECM. The music they created is still as distinctive as when they recorded between 1992 and 1997 and the release now of a box set of the four albums in the label’s Old and New Masters Series is especially salutatory, coming as it does close to the first anniversary of pianist John Taylor’s death. His playing and composing is a defining element of the trio’s sound. The third corner of the triangle was of course Palle Danielsson. The first release You Never Know begins with the cycling, slowly mutating piano figure of New Old Age. Erskine waits an implausibly long time to enter with the sizzle of a cymbal after the sound has been anchored by Danielsson’s glowing bass. It sets the tone. The drummer leader’s conception of restrained dynamics, a conversation amongst equals, pieces that have a natural arc with solos a non-event, this was often fully realized. With nearly half of the tunes in the trio’s repertoire coming from Taylor’s pen however and the rest drawn significantly from Vince Mendoza, Erskine himself and a sprinkling of Kenny Wheeler, there was very rich terrain on which to apply these principles. The very next piece is the bustling Taylor composition Clapperclowe, bursting with energy. Erskine’s On the Lake that follows, signals his instinct for distilled, folk like structures and progressions albeit given a twist by the striking theme constructed around a two note figure. That first set concludes with a sublime viscerally swinging take on Cole Porter’s Everything I Love. The subsequent three albums move between the shimmering moods of Terraces that opens Time Being, flights of lyricism such as on Mendoza’s Esperança on As It Is the minimally adorned arrangement of Walton’s Touch Her Soft Lips and Part and the slightly greater abstraction and freer sound of the final album Juni that nevertheless condenses into a a rocking groove on The Ant and the Elk and blistering swing on Twelve. The dynamism, creativity and melodic and harmonic fluency of Taylor and Danielsson flood the music with light and airiness and the rapport with Erksine, whose drumming somehow conjures momentum almost without playing, is wondrous. It’s hard not to concur with Erskine’s own assessment of the trio, “a truly unique group … nothing like it before or since”. The four CD set comes with a booklet replete with extensive and illuminating notes by John Kelman. This is an appealing document of a remarkable trio.